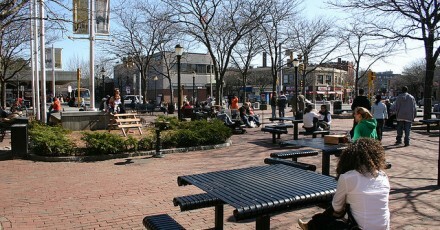 Somerville’s Davis Square is one of the closest neighborhoods to Tufts, and one of the most popular off-campus destinations for Jumbos. Students can catch a movie at the Somerville Theater for the lowest prices in Boston, munch on flatbread pizza while duckpin bowling or enjoy some of the best BBQ north of the Mason-Dixon. If you’re looking for mac-and-cheese on a burger, ice cream, or retro clothes shopping, Davis is the place for you. The 10-minute walk back to campus might do you some good after a weekend feast, but the free Tufts University Shuttle runs back to campus all day if you don’t feel like a stroll. Davis is also home to the closest subway, or ‘T’, stop to campus. From Davis you can reach Cambridge, train stations and airports, and of course the city of Boston. A trip from Davis Square to the Boston Common will set you back 20 minutes. The MBTA’s Red Line will take you from Davis Square to Park Street, home of the Boston Common and the Massachusetts Statehouse. 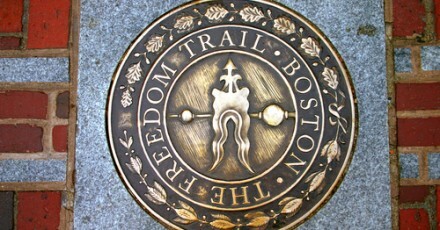 From here, you can walk almost anywhere in the city of Boston. A stroll down the block will lead you to the theater district, home to off-broadway productions, or to a vibrant Chinatown. If you head towards the harbor, you can visit the Boston Aquarium or explore the city’s seaport. Further north is (appropriately) the North End - Boston’s Little Italy where every doorway is an opportunity for an amazing meal and the best cannolis are filled with ricotta. A quick transfer at the Park Street station will put you on the Green Line and on track to Boston’s Back Bay. Once a literal bay, it was filled in during the 19th century and is now Boston’s shopping hub, home to Newbury Street, the Prudential Center and Copley Square. You can catch a Sox game at Fenway Park (or ‘pahk’ depending on who you ask), attend the annual Tufts night at the Boston Pops orchestra or cash in (so to speak) your free admission to the Museum of Fine Arts. There are countless places to eat, tons of things to explore, and endless adventures to be had in America’s biggest college town. Explore Davis Square and Tufts' campus through our interactive virtual tour. Wondering what its like to get off-campus? Current students explore the annual event "Honk" in Davis square with friends. Visitors can enjoy guided (or self guided) tours of downtown Boston's rich American history.